It was about 10 minutes through a design review. All eyes were fixed on the projector screen evaluating the newly presented concepts. My voice was the only sound in the room and everyone was still. Going into the review I was excited to share these new concepts and felt there were a lot of very strong ideas. I was getting antsy…there was no way for me to tell what everyone was thinking, and I was hoping to have some kind of reaction by this point. Now THAT was the reaction I was hoping for. What happened here was a deeper level of validation for a design direction. 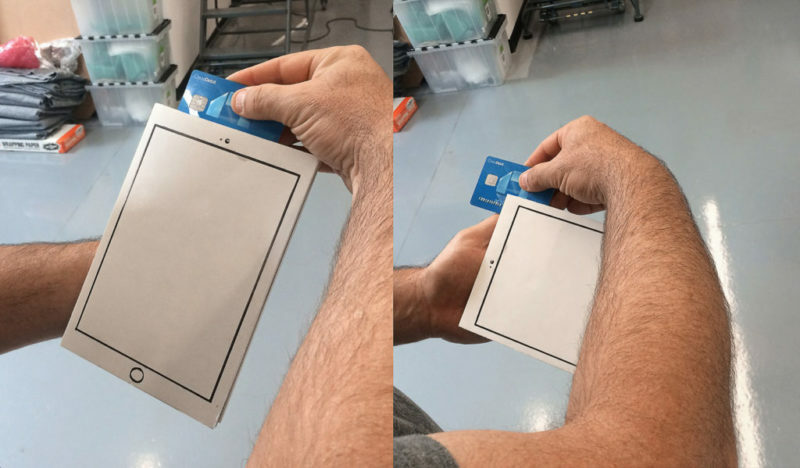 A physical connection was created between user and product…something that cannot be made with a sketch or illustration on screen or paper. This is powerful. Regardless of whether feedback is positive or negative, physical models provide a much more ‘real’ experience of what your design intent is. Often, models reveal things you didn’t expect or intend – and that is one of the huge benefits of creating them at appropriate times throughout the design process. So….When should models be made? Also, how should they be made, and to what level of detail? To answer these questions, a few more questions need to be asked. What is the purpose/intent of the model to be made? How much time will be needed to build it? Sometimes a model should be made at the very start of a project. A quick, rough, full-size foam core model can be produced quickly. Without including any design work/details, there is a lot of valuable feedback you can gain from an initial build like this. Not all projects will benefit from this type of early stage model, so it’s important to have good judgement when deciding the appropriate time to build one. 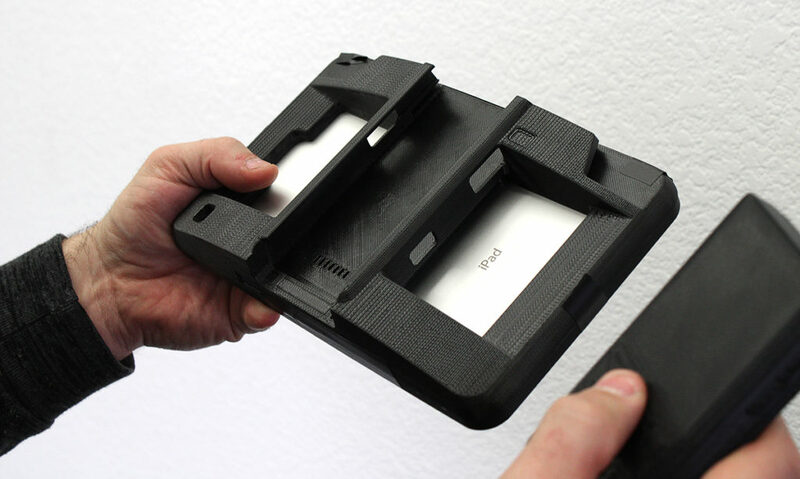 Quick foam core models were made to evaluate orientation, positioning, and comfort during the early stages of the iSMP4 Universal Tablet project. Hand built models can also help avoid taking a poor design direction into CAD, resulting in a poor investment of time. A beautiful design doesn’t always equal a successful solution – it’s the classic “form follows function” logic. 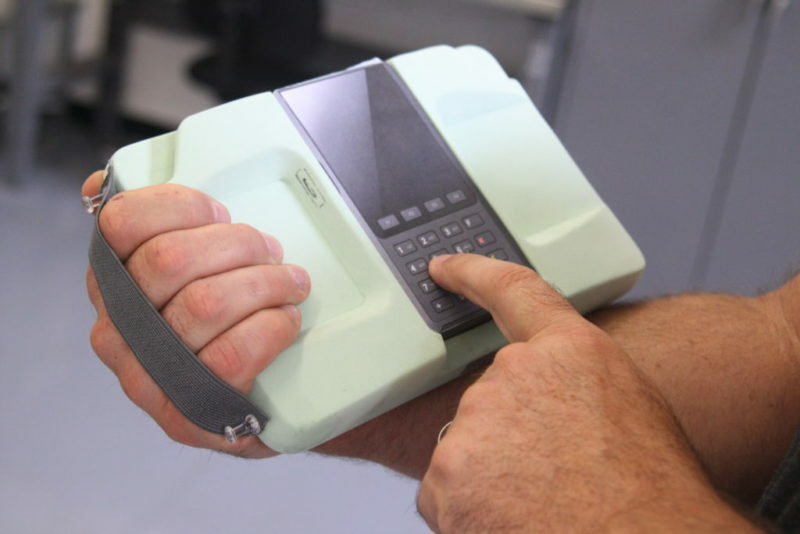 To test ergonomics and comfort, various foam models can be made for evaluation. These don’t have to be fully designed solutions either. It can be better to dial in comfort and ergonomics first, and then design around that. Physical models will often start defining the constraints needed to finish out concept development in a more efficient and direct way. Depending on the time available and details needed, there are various materials and construction processes from which to choose from to build a physical prototype. Foam core, Medium-High density polyurethane foam, wood, soft goods (straps, Velcro), kit bash prototyping (a form of dissecting existing products and reassembling into new forms), and the many options with 3D printing are all viable options. Physical models will often start defining the constraints needed to finish out concept development in a more efficient and direct way. 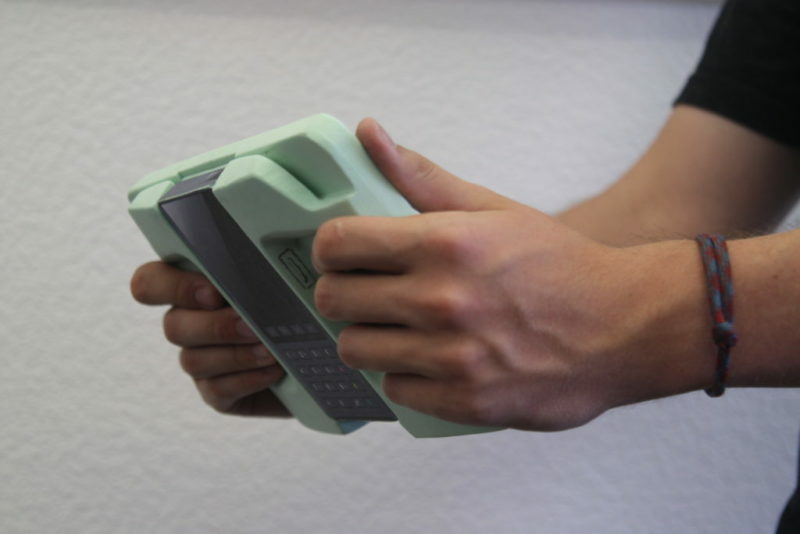 Quick foam model to evaluate size, and ergonomics on our iSMP Universal Tablet project. Over just the past 10 years, technology has changed drastically when it comes to higher detail level model making. 3D printing is saving enormous amounts of time while also providing a solution where craftsmanship is almost a non-issue. I remember the days of starting with a block of foam and slowly carving out details until my design took form. It was fun to be hands on, but was frustrating when something would be off. One wrong cut on the band saw, over sanding too much, or not quite getting the symmetry correct – these were all things that that would show through negatively after completing. Most times it wouldn’t matter if little things like this happened, but as a perfectionist it would drive me a little crazy. These days I rarely find myself in the shop working on foam models worrying about these kinds of issues. Instead, I am MUCH more often pressing a print button in software sending a digital file off to be built with perfect accuracy…and I get to go on doing other tasks while I wait for it to finish. Opportunities to build physical models will often come up unexpectedly. Within a project scope there will be predetermined stages that call for prototyping. However, even if NOT predetermined, it sometimes makes sense to build something when it will help decisions/progress move more quickly. Continuously evaluate where you are in development and be ready to shift plans if you know it will lead to a better result while also saving time. This takes experience to fully be effective. At Juggernaut, our team has the experience to identify these mid-project opportunities which will in turn yield stronger design and quicker turn around. Physical prototyping is just one of the ways to do this, but definitely a powerful one.